Please get in touch! Our friendly team are always more than happy to help. The Specialist Contact Lens Practice is conveniently located in Birmingham city centre, directly opposite New Street Station. 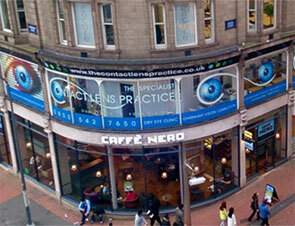 We are situated on the corner of Lower Temple Street on the first floor above Caffe Nero. The entrance is next door to the Shakespeare pub. We are in a pedestrian only area so there is no car access. There are a number of car parks within close proximity of the practice. The closest being Grand Central’s car park just a few minutes walk from the practice. The Mailbox car park is also nearby and within a 10 minute walk of the practice. To find us from there, keep straight along Navigation Street following the signs to New Street Station and you will find the practice opposite the station above Caffe Nero. New Street Station sits below Grand Central Shopping Centre and John Lewis. Exit the station at Victoria Square and we are located just across the road above Caffe Nero – you can only miss our practice if you need new glasses or contact lenses. Please submit your request and a member of our team will get back to you soon.